5,500-year-old fingerprint found on ceramic vessel. Seeing that I love birds I thought this post from Squirrel Basket would be nice for my fellow bloggers to enjoy. 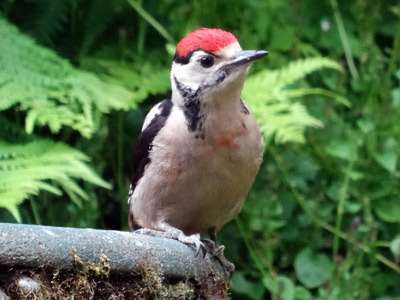 In May and June there have been plenty of baby birds in the garden and I have been trying to capture them. Mostly I have been disappointed. My pictures are rubbish, really. But I felt I wanted to share them just to prove the variety of species we have breeding in our backyard. When we first moved from England to come and live on this lovely Island of Crete I was not too concerned about having a garden. This was because previously we had large gardens which entailed lots of work and mowing of lawns. 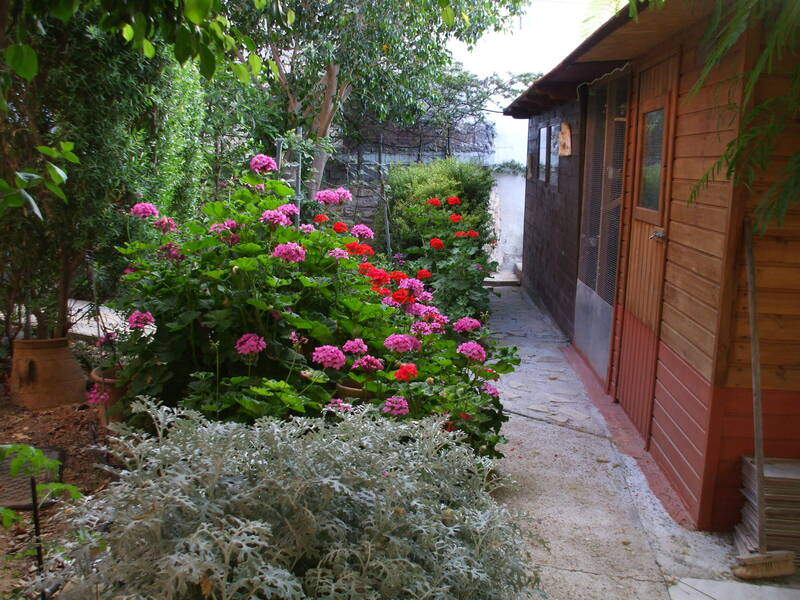 So the first house we purchased here in Crete had no garden but a very nice, but small courtyard where I could just grow flowers in pots. After all we were retired, and thought the less work we had to do the better so that we would have plenty of time to explore the island and enjoy ourselves. This of course is what we did for about two years. However, as time went on I found I was beginning to miss having a garden. I also missed having a pet around the house so decided I would have a pet dog, another excuse for a garden for him/she to roam around with some freedom. 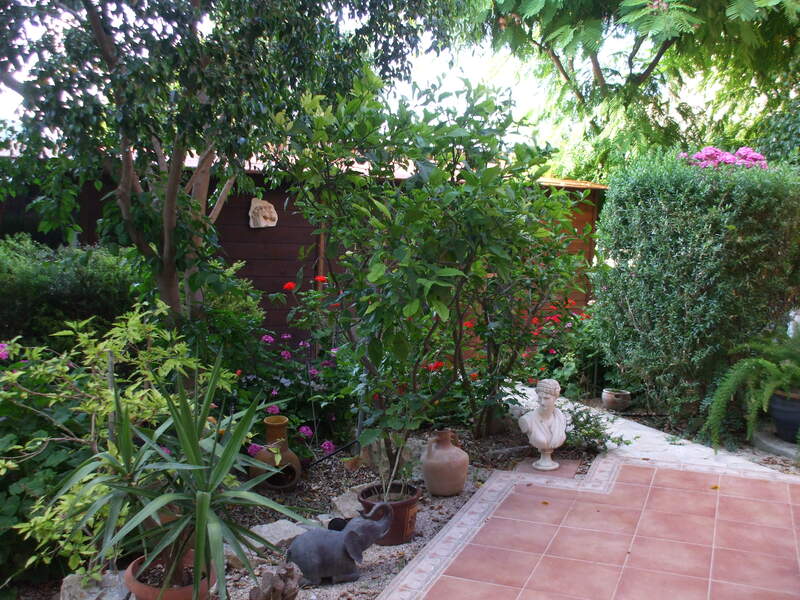 It is unusual to find a house with a garden in a village, because most of the villagers have separate plots of land where they grow their vegetables as well as olive trees. However, we finally found this house we call ” ExLibris ” because it was once an old library as well as a taverna at some stage way back in time. So it has quite a bit of history attached to it. Yes it has a garden, well it is a garden now but when we first purchased the place it was just a plot of ground with nothing but weeds. It had been empty for 30 years so of course it had to be renovated which took around 4-5 months to complete. 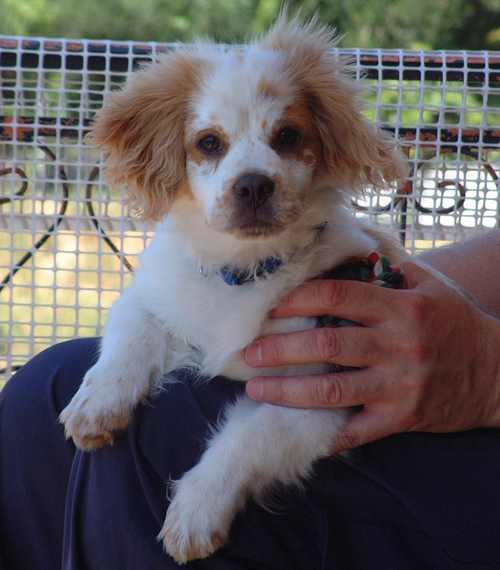 In between time we had a rescue dog which had been found on one of the mountains just abandoned with three other puppies, and I mean newly born puppies. It was my friend who, while walking her dog found them,she reared them for 12 weeks after which I had Ben who I am sad to say we lost only last year. I like to think he was happy with us, we had lots of fun together and we miss him very much. Ben age about four years old. 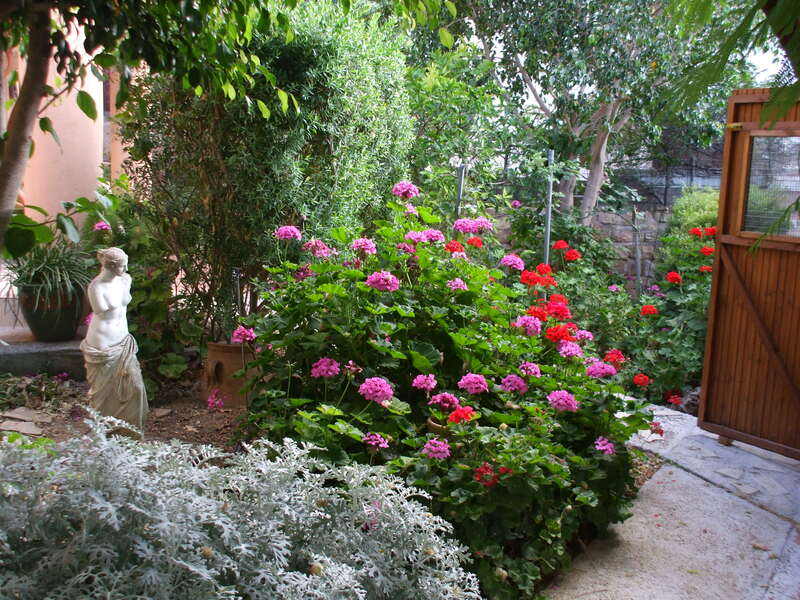 ENJOY a walk with me around our garden in Crete. This is my favourite place where I can sit and read as well as listen to the Canaries singing in the aviary. Notice Bens basket under the swing because I still can’t bring myself to part with it. John’s Aviary. 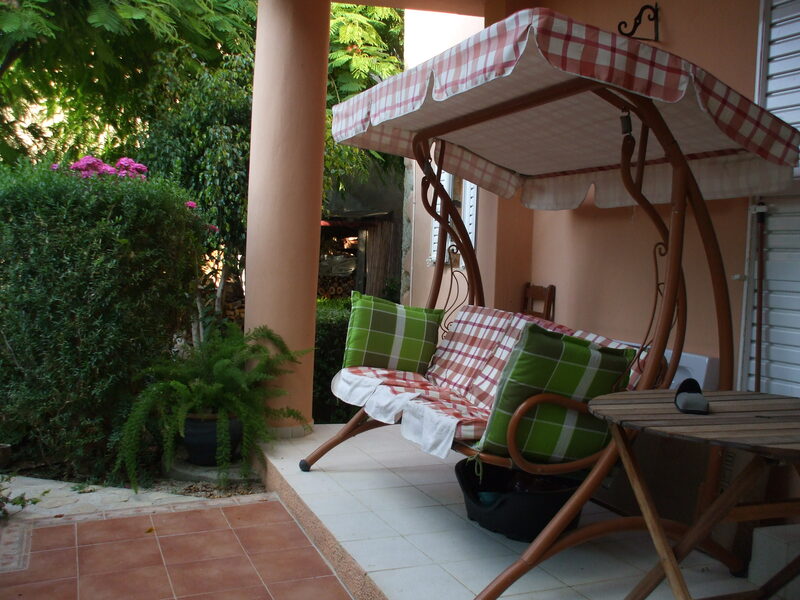 The garden swing is through the path to the left . 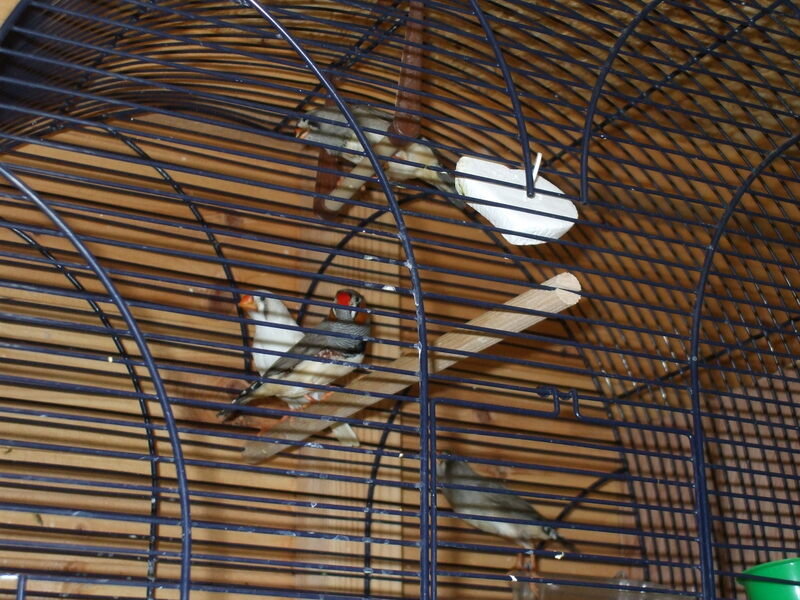 Here are some baby finches born this year. 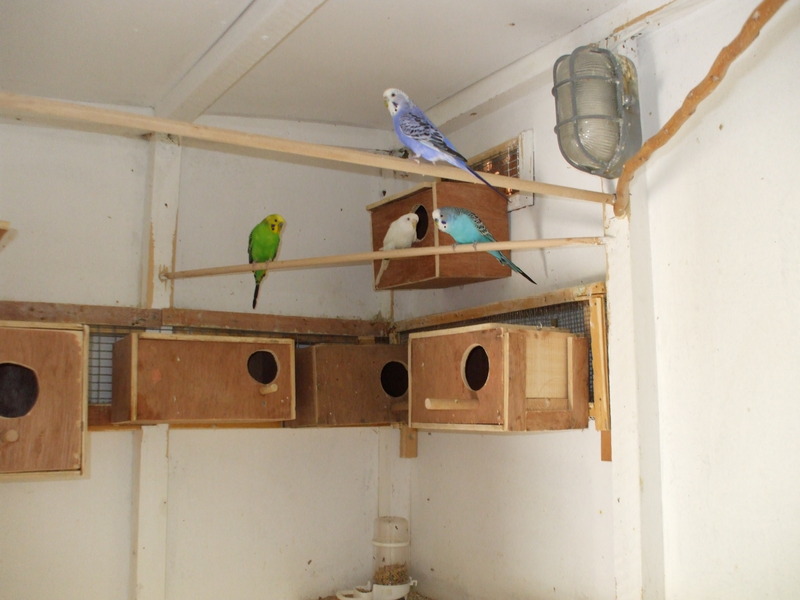 Budgerigars choosing their nesting boxes. They do have their favourite places. 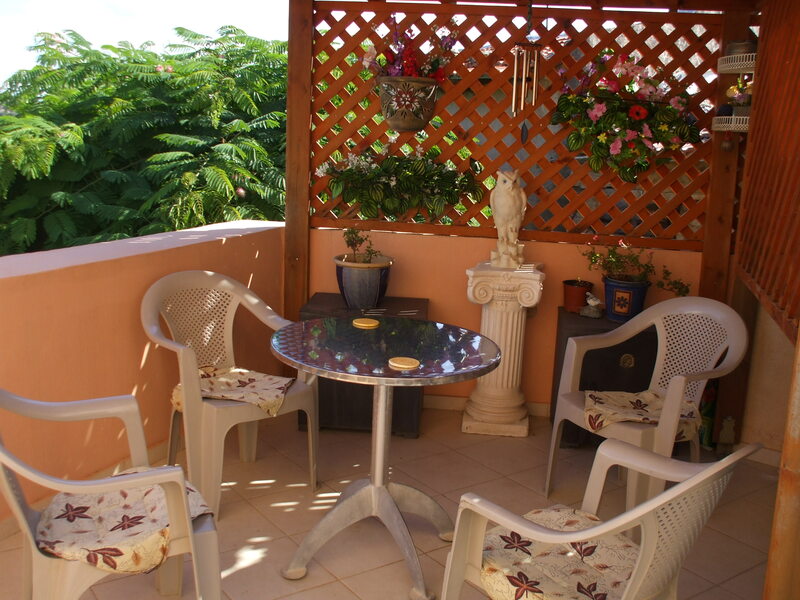 Balcony overlooking the garden. 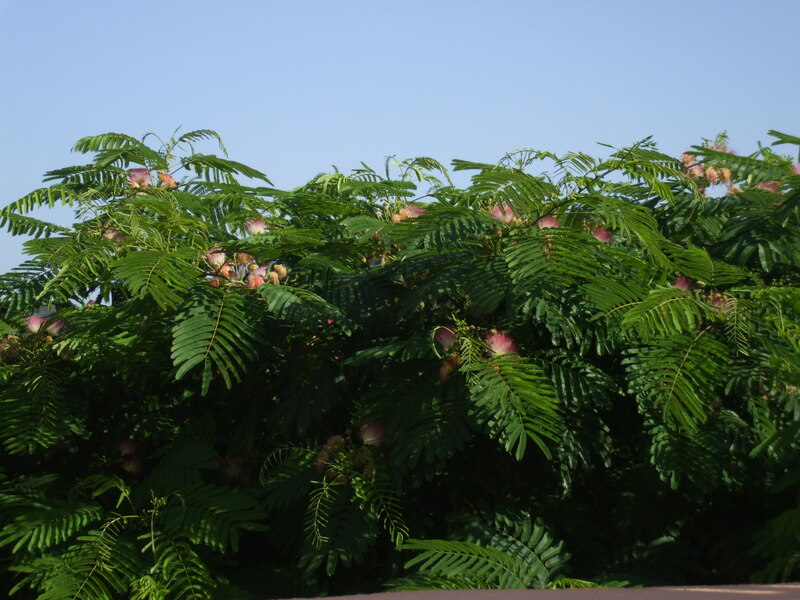 You can see how high our lovely Acacia trees have grown which are wonderful for the shade. And these are the beautiful pink and white pom-pom type flowers which give off a wonderful fragrance especially during the evening. Aviary door open for fresh air in the aviary. There is also a fan inside to keep the birds cool during the hot summer months. 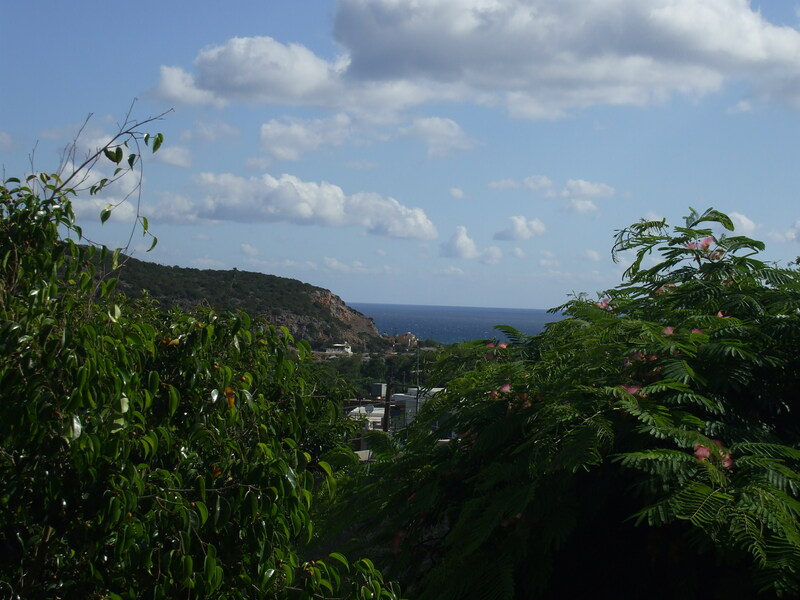 And lastly you can just see the sea from the balcony from which there is a cool breeze most days. 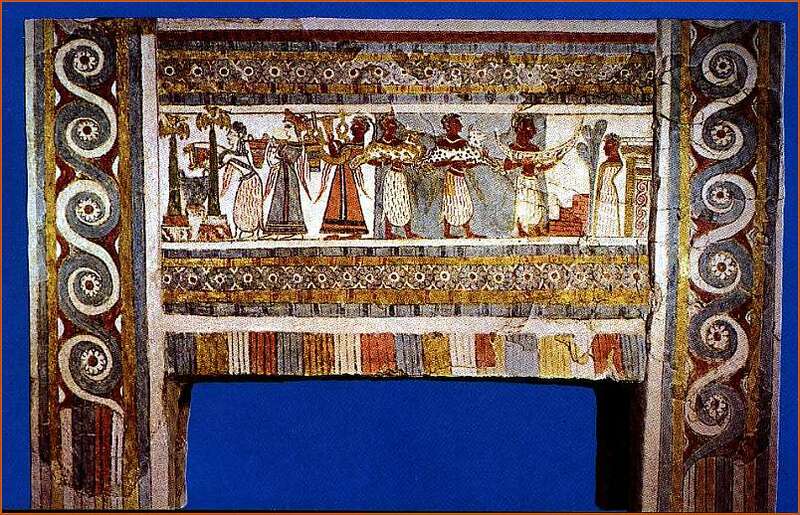 This beautiful sarcophagus housed in the Heraklion Museum Crete depicts a deceased on the right side with men bringing gifts. Two women on the left hand side pour a libation. A lyre player is shown and at the bottom an aulos player. The paintings are bright and delicate but at the same time very solemn as they describe the sacrificial ceremonies for the dead prince who once lay in the sarcophagus . Although the colours have faded a little there are stunningly fresh madders, rose pinks and emeralds and there is a sense of movement and life. 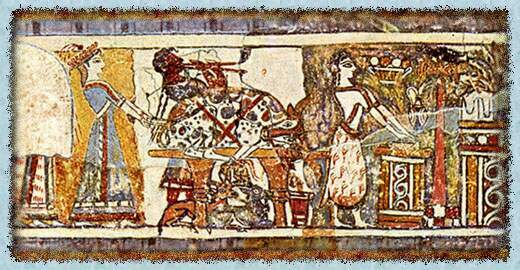 The sarcophagus dates from a period long before the building of the great Knossos palace, and is therefore the oldest European painting to have survived. On one of the sides of the sarcophagus a bull tied with brilliant scarlet ropes to an alter has been stabbed. The blood is dripping into a bucket. A priestess blesses the dying bull and the procession moves towards the alter surmounted by the double axe. The reverse side depicts “the great two handled urn which will receive the blood of sacrifice offered by the priestess. There follows a woman with a strange bird-shaped crown, who carries two baskets over her shoulders, these baskets contain the thighs of the bull, which will be burned perhaps on the steps of the columns crowned with the double axes. Behind this woman comes another, the most stately of all, who plucks at a seven-stringed lyre with a plectrum. From these woman fall rippling banners in the shape of feathers, announcing they are the servants of the goddess represented by the dark bird”. At one end of the perfectly balanced panel..is the blood of sacrifice falling into the sacred urn, at the other end…..is the dead man rising in the sacred grove. As the blood is poured, so life flows in the dead. Unmistakenly the panel portrays a resurrection, the long-wished-for return of the young prince who died about 2040 BC”. For those of you interested in Mythical Legends this is a beautiful post. Enjoy ! The white stag, like many other mythical creatures, wanders through the tangled forests and wild moorlands of our distant past. Elusive and rare, our forefathers may have caught a glimpse in some hidden glade in the woods, or seen it moving ghost-like across the wild moors, or maybe stood high on a rocky outcrop crowned against the sky. The white stag was always something to be desired yet always out of reach. Always leading the hunt onwards, ever onwards, to a destiny ordained by the gods. From the dark, distant memories of the Wild Hunt have grown the very stuff of legends. 1917 blackboard lessons found in Oklahoma City school. I just had to re-blog this. All mothers will appreciate the read.